Congratulations, acolyte: you’ve taken your first step into a larger world. Wet shaving is awesome, as I can attest, but I can readily admit it can be a bit daunting to figure out where to start. There’s about one million things you seemingly need to buy, all of them claim they’re different but sort of look the same, and you’re still thinking about the prospect of cutting yourself on that very first shave. Let me reassure you that you’re not alone; that happens to everyone. However, once you get past all the skittishness and trepidation that goes into wet shaving, it comes time to build your first kit. Thankfully, you’ll get a lot of advice on the Internet; this here is our attempt to do the same. We’ll treat you right, and hopefully by the time you’re done you’ll have a better inkling of what to get for your first wet shaving experience. What is Wet Shaving ? We want to fill you in on a little bit of information before we jump into what you will need to have a fully loaded wet shave kit. For starters, what is wet shaving? Well in all reality it is pretty much what it sounds like. Your face will remain wet throughout the entire shave process and you will use a single blade razor, shaving brush, glycerin based shaving soap and a shaving mug to work a lather in. We’ll go into more detail about that later though. Wet shaving does take a bit longer than your normal shaving routine with a standard or electric t razor, Try to keep that in mind and squeeze the time into your daily routine. If your grandpa and great grandpa could fit a shave like this into their day, we are sure you can too. Why, indeed? There are some pretty sweet benefits to wet shaving that will probably make you feel a bit better about having to fork over some cash to get your wet shave kit started. Save money: Think about how much it cost you the last time you had to buy cartridges for your razor. We are going to bet it was somewhere around $20 or so. That means that you just dropped $2.50 per cartridge. No thanks, man! We would rather spend the 25 cents that the double edged safety razor cost us. You will also save some coin by using old school shaving creams and soaps. The chemical loaded stuff that comes in a can will cost you around $5. It doesn’t last all that long and you won’t get the best quality shave with it. Environmental impact: When you wet shave you only have a single metal razor blade to dispose of and the paper wrapper or small container that you shaving soaps come in. That’s all the waste you have right there. Using disposable razors and canned shaving creams creates much more waste that will just hang out in a land fill. Better and smoother shave: There’s nothing like the smooth and consistent shave that you get from a wet shave. Electric and disposable razors are prone to irritating the skin and can leave you with razor burn, ingrown hairs and redness. Oh and not to mention that the closeness of the shave pales in comparison to one performed with a double edged safety razor. When you begin wet shaving you will probably notice and immediate change in how your skin looks and feels. You’ll feel like a boss: You’re going to be taking part in a ritual that all of the great men in history did. You’ll be kicking it old school just like your grandfather, Harry S. Truman and Ben Franklin. So toss those expensive disposable razor cartridges and chemical leaden gooey cans of shaving cream! It’s time that we bring you into the fold of wet shaving and let you know what you’ll need to complete your kit. First things first, you have to pick your razor – this is the cornerstone of your entire wet shave kit. This is the tool that all the other tools are basically there to support, with maybe the exception of the blade (but these go hand-in-hand, so it’s most important to make your first big decision here). There are a lot of different models out there, all with their own spins on the material – some good brands are Merkur, Edwin Jagger, and even some older Gillettes can be thrown into the mix as well. In order to pick the right razor for you, just keep researching and reading up on reviews – decide whether or not you want open comb (a rounded ‘comb’ on the edge of the razor) or a closed comb, fixed-gap or adjustable (i.e. whether or not you want to be able to change how far the blade sticks out), two-piece or butterfly (i.e. the way you change out razor blades), and more. This is the hard part, so find the best balance between comfort, price, effectiveness and closeness of shave, and you’ll be good to go. Once you’ve got the razor picked, it’s time to pick your blades. There aren’t as much variation in blades as there are razors; double edged razor blades, after all, are marketed and designed so that they’ll fit in virtually any DE safety razor. All the same, there are still slight differences in angle, sharpness, packaging, and price that will make you want to look very closely at which blades work for you. What we recommend doing is picking up a sample pack – you can try out different kinds of razors from different companies, and see which ones fit your experience best. That way, when it comes time to order more, you have a better idea of which brand is your favorite. I honestly can’t recommend sample packs enough (they’re also great for when you forget to buy more of your standard brand and you need backups!). After you actually figure out the stuff you’re using to scrape facial hair off of you, you’re going to want to look carefully at the lubricant those razor blades will be working against. You’ve basically got two different options – there’s shaving soaps and shaving creams. 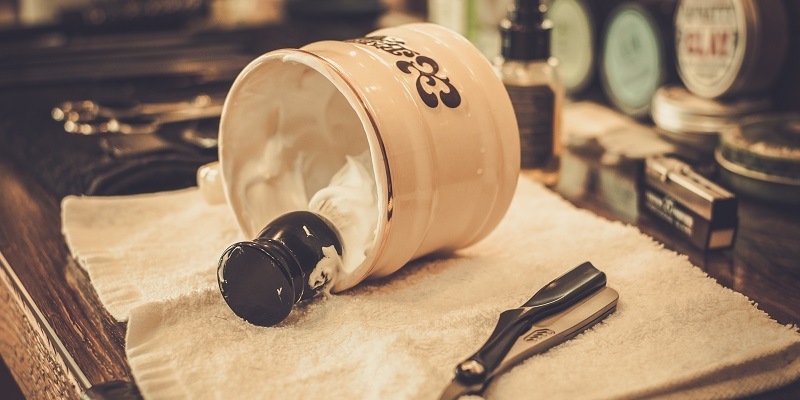 Shaving creams are pretty much just like the Barbasol can you use to shave with now, but with your wet shave kit you’ll want to get something that doesn’t come out of an aerosol. There are plenty of absolutely awesome shaving creams out there that work fantastically, and sometimes don’t even have any air in them to foam up – it’s all just natural oils and herbal ingredients that will treat your face wonderfully. Shaving soaps, on the other hand, are a bit more traditional to the wet-shave experience, though you still lather them. Shaving soaps are great since you get to control the level of lather that goes into them, they are usually healthier for you, and they provide a nice lubrication for the razor blade so there’s no nicks, cuts, or redness and irritation. All in all, soaps or creams aside, it’s really up to you, as both of them have their unique benefits. Finally, there’s all the REST of the stuff that will go into your first shave kit build. Perhaps the next most important thing after getting the soap or cream is a shaving brush – you want to find something that has medium bristles (like horse hair or badger hair), and a comfortable and cool looking grip on the handle so you can feel good about using it. After that, there’s all manner of other things, like pre-shave and post-shave lotions that will help keep your face healthy before and after the shave itself. Also, there are shaving mugs and scuttles that give you a nice, perfectly designed receptacle for lathering up your soap or cream with the brush. While you can really use any old thing to do that, the scuttle itself provides an ideal environment, so your lather will go easier. There’s a lot of other bits and bobs you can invest in if you really want the totally decked-out wet shave kit, but we guarantee these first few steps will get you started with a nice, basic kit in no time at all. Godspeed and good luck!